The list is built up by Parish in alphabetical order and includes Wells and Pumps which are both private and public. The list includes Pumps and Wells, which are listed, found in historic water supply documents, physically found by the Author or brought to the attention of the Author by an Owner. Those parishes where there is currently no Well or Hand Pump listed may still have Wells and Pumps in existence, but none have been found or reported to the Author to date. The following list of entries is bound to contain omissions and the Author would be pleased to receive details of these. Permission must be sought if wishing to visit those pumps which are not on public property. 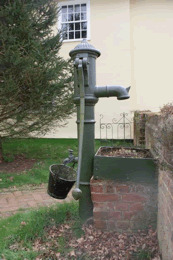 The location and description of each pump and Well has been recorded, including whether it is listed and includes any other archaeological or Well series recording descriptions. Finally details of the shaft or water raising devise are recorded and whether the Pump or Well is in working order. The Gazette is divided alphabetically into seperate files. Click on the letter corresponding to the name of the parish. Additions to the database can also be notified to the RUH website and added here. For recent additions, click here.